From deeplyvale.com: "In the middle of the 70's there was a free festival organised in a small valley near Bury in Lancashire that became known as Deeply Vale. The site was not easy to find but once found it soon became apparent that it was idyllic for the purposes of a multi-day festival and it gained enough recognition to attract the likes of Steve Hillage and Here and Now to play there." The Deeply Vale Free Festivals documentary 'Truly Madly Deeply Vale' is on Granada Television, at 11.30pm for one hour on Friday 19 November 2004. Amongst the people interviewed about the four summer festivals in the valley between Rochdale and Bury between 1976 and 1979 which grew from 300 people in 1976 to 3000 in 1977 and 20,000 in 1978 and 1979. The Durutti Column played at Deeply Vale in July 1978. Tony Wilson compered the new wave afternoon in a white suit. The Durutti Column featured Vini Reilly, and amongst others, Tony Bowers on bass in a green boiler suit, and Dave Rowbotham on guitar. This was their fourth ever gig. The following people who played at the festival or were in the audience [some very young but it set them off in their career in the north west music scene]: Jimi Goodwin of Doves, Luke Bainbridge of the Observer Music Monthly, Graham Massey of 808 State, Alan Hempsall of Crispy Ambulance, Trevor Hyett (seventies Granada TV presenter and compere at Deeply Vale and many Rock Against Racism events), Pete Farrow (Stockport Folk Blues troubadour), Jim Milne and Steve Clayton of Tractor, Chris Hewitt (Tractor's Manager and Deeply Vale Organiser), Grant Showbiz (producer and soundman for Here and Now, the Smiths and The Fall and Billy Bragg), Steve Cowen (drummer Mock Turtles), Steve Hillage (seventies Gong guitar hero and now ambient dance specialist), Vini Reilly of Durutti Column, Phil Odell and Stanny of Whitworth Punk band Wilful Damage, Mark E Smith, Stuart and Steve Murray of Fast Cars, Henry Klejdys of Street Life, Street Theatre of Rochdale in the seventies who has recently worked on Phoenix Nights and now works on The Bill, to name but a few. Ozit Morpheus Records- a Northwich based label (since 1986 but originally from Rochdale) that specialises in underground and 60?s and 70?s rock albums ? most of which are exported to Europe, USA and Japan has always had strong links with John Peel. One of the directors of the label Chris Hewitt explains- "back in the early seventies John Peel signed the band that I manage "Tractor" to his then newly formed [and now legendary] Dandelion Records label. Tractor have been one of his favourites through the years and are still recording, performing concerts and have just issued a dvd. All these activities by Tractor got regular mentions on Peel's BBC Radio One show and in fact in october last year he got a telling off from the BBC for mentioning a forthcoming concert by Tractor and playing tracks of theirs on Radio One five times in a week. Such was the dedication of Peelie to the bands he worked with"
"I had spoken to John recently and he was thrilled with the addition of a grandchild to his family"
"Back in the seventies Tractor and myself were involved in the promotion of a legendary north west pop festival which is the subject of an ITV documentary currently being filmed - the pop festival ? 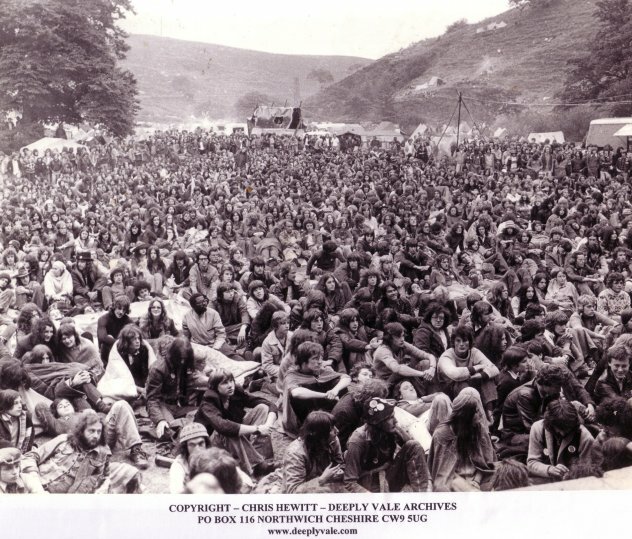 Deeply Vale Festival was held in a valley in Lancashire and in its four years grew from 300 people attending in 1976 to 20,000 people attending in 1978 and 1979." The link to Peel exists here too says Chris Hewitt "we got a good advance off John Peel to buy a large PA system in the seventies - one of the first stereo sound systems for bands in the north west - and that enabled us to organise the Deeply Vale festivals". The Deeply Vale legend is to be the subject of a tv documentary, a book and is already a dvd. Deeply Vale festival can be investigated further at www.deeplyvale.com. John Peel had actually agreed to do the commentary/voice over for the forthcoming Deeply Vale festival tv documentary but owing to his commitment trip to Peru [where he sadly had his heart attack] his friend Bob Harris had agreed to do the commentary instead. Chris Hewitt- "John played almost everything we released on Ozit Morpheus records and of course we have released several Captain Beefheart albums and that is one of his all time favourite album artists. Two years ago he played twenty three tracks from one of our Captain Beefheart releases over 23 consecutive nights of his show. He will be sadly missed in the music industry and pride of place in my photo collection at the moment is John Peel and I in discussion side of stage at a festival in the eighties". The programme was broadcast twice in the Granada region. Thanks to Chris Hewitt for info and media.